The Lynx L-3 is the perfect travels scooter. This scooter will hold up to 250 lbs., yet is light enough to easily take apart and transport in small car trunks. The Lynx L-3 is sturdy, yet the total weight of the scooter, with batteries is only 103 lbs. 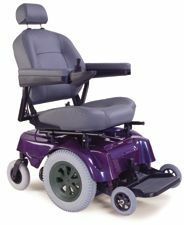 Remove the seat, batteries and basket and the base of the unit breaks into 2 pieces, with the heaviest piece only 30 lbs.!! This makes the Lynx L-3 the perfect scooter of choice for vehicle or airline transportation. The Lynx L-3 also offers an 8 degree incline capacity. The Lynx L-3 has many great features such as solid tires, on or off board battery charging, and connect -free drop-in battery pack. The 360 degree swivel seat and 250 lb. 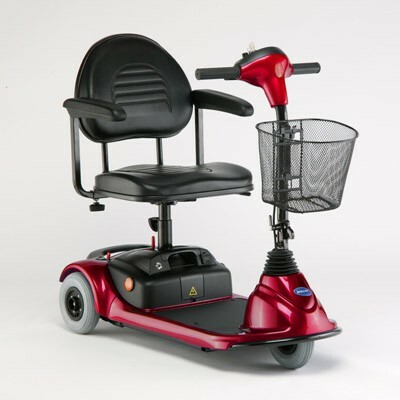 weight capacity, as well as an attractive price, make this the travel scooter of choice for many people on the go! Easy, 4 piece disassembly. Heaviest piece ONLY 30 lbs.!!! Wheel Size - Front and Rear - Solid 8" x 2"
0 to 5 m.p.h. variable speed control. Total Weight w/batteries 103 lbs. Weight w/o batteries 80 lbs. Comfortable 360 degree rotating seat.